For the fourth time in less than a decade and half the UK is at war, and once again the vast majority of the victims will be Muslims. Bolstered by the votes and voices of the Labour right, on 2 December David Cameron finally secured the parliamentary majority he needed to extend military operations to Syria. The star performance that night was not the prime minister’s however. The media’s plaudits were reserved for shadow foreign secretary Hilary Benn, who invoked the memory of the International Brigades and their fight against fascism to build a case for war. Although opposition to intervention in Syria is growing outside parliament, with thousands protesting in the square outside as the debate took place, Benn’s arguments are important because (not for the first time) they serve the interests of the British ruling class by translating Cameron’s imperialist adventurism into a language that has a resonance far beyond the coteries of Labour MPs plotting to overturn Jeremy Corbyn and crush the unexpected resurgence of the Labour left. In order to counter these arguments effectively, we need to show how they are based on a faulty analysis of what kind of organisation ISIS is, where it came from, and what its strengths and weaknesses are. In order to counter the accelerating drive towards imperialist war in the Middle East, and intensifying racism, Islamophobia and repression in Europe, we also need to do more than this. We have to make a clear and coherent case that the real alternative to imperialism, the Middle East’s dictators and despots, and the vicious sectarianism of ISIS will be forged by the people of the region themselves, in their struggles from below for social justice and democracy. A left that despairs of this now, after witnessing millions take on the tyrants from Morocco to the Gulf in a popular uprising without precedent in the region’s history, will not offer any alternative at all. A left that contents itself with mouthing apologetics for RAF bombing missions, or oscillates between one or other of the local powers and their global sponsors will be equally impotent. This article will argue that there are three main elements to an analysis which avoids falling into the traps outlined above. First, we need greater clarity about the role of imperialism in the region (both the Western variety and the Russian version). Getting this question right means not falling into mechanistic analysis or conspiracy theorising, understanding the dynamics of competition and conflict between and within the states of the region and the global powers, and appreciating the uneven agency of the different actors in this process. Secondly, we have to get right our analysis of racism and Islamophobia in Europe, understanding that the ever-expanding battery of repressive laws dressed up as “counter-terrorism” may be rooted in the legacy of colonialism, but are an essential counterpart to the strategies of our rulers in their attempts to dominate the Middle East today. An analysis of the 13 November massacres in Paris or the killing of the Charlie Hebdo journalists which fails to set these acts in the context of the systematic social exclusion and political repression of Muslims in France, rooted in the history of a racist “civilising mission” dressed up in the universalist language of revolution against absolutism, risks not explaining anything at all. Finally, we need to be clear and concrete about where the alternative for the region really lies and who can bring it into being. This means not only properly understanding the dynamics of revolution and counter-revolution that have gripped the Middle East for the past decade, but looking forward to debating strategies for the popular uprisings of the future. A crucial part of that strategy, we will argue here, lies in correctly ­understanding the role of Islamism in the region. It requires an analysis which distinguishes between mass movements such as the Muslim Brotherhood, which in Egypt ended up reprising a similar role to social democratic reformists in the context of a revolutionary crisis, and armed jihadi groups. Failure to do this feeds into the despair that expresses itself either as apologetics for imperialism or various unpleasant regimes, or turns into paralysis. Where does ISIS fit in? One of the key arguments advanced here is that all the different parts of this analysis are needed to understand the ISIS phenomenon properly: it is born out of the destruction caused by imperialism, out of the crushing of the hopes of revolution and feeds on the despair bred by racism and Islamophobia in Europe. But it is equally important to grasp that ISIS is only a small part of a much bigger picture. It is easy to be mesmerised by the horror of the battle over Raqqa, but we cannot forget that the more important frontlines are those still to be drawn. The disaster of US intervention in Iraq also created the conditions for the rise of ISIS in a number of broader ways. Although the US remained the most powerful global power in the region, its position had weakened both militarily and diplomatically. Regional powers, both allies of the US such as Saudi Arabia, Turkey and Israel, and its foes, such as Iran, gained room to manoeuvre as a result. In the case of Iran, the impact of US ­miscalculation in Iraq was clear to see. The leadership of the Islamic Republic built on longstanding ties with Iraqi Shia Islamist opposition movements before the overthrow of Saddam Hussein, and benefitted from the installation of its clients at the heart of the reconstituted administration through US policies which deepened sectarian competition across state and society. Decades of US intervention in Iraq thus resulted in the interaction of three processes which were to have profound consequences for the fate of the Syrian Revolution. The embedding of sectarian competition in the neoliberal post Ba’athist state created a number of important actors in Syria’s conflicts, including ISIS itself and sectarian Shia militias which mobilised to defend the Assad regime. The sectarian polarisation also occurred at a regional level, becoming the general ideological cover for intensified competition between Iran and Saudi Arabia. This meant that the ambitions of both regional powers and the great powers which stood behind them flowed into and shaped the dynamics of counter-revolution and civil war. Finally the waves of mass displacement not only scarred Iraqi society, but placed enormous strains on Syria, which hosted millions of Iraqi refugees in the decade before the 2011 uprising. It is important to emphasise that the extreme brutality of Bashar al-Assad’s revenge on Syrian people made the transformation of the revolution into civil war almost inevitable, and sectarian conflict highly likely. Combined with the devastation of Iraq, it created a catastrophe on a scale not seen in the region for decades. Over the following months the uprising was transformed into an armed conflict: on the opposition side Islamist armed groups with access to funds, weapons and experienced fighters came to dominate, pushing aside other groups. Many of these groups had been successful in winning the backing of regional powers, particularly the Gulf states, which sought to influence the outcome of the conflict by providing arms and funding. An opposition offensive in July 2012 forced government forces to retreat from large areas of the country around Aleppo, Idlib, Deir Ezzor and Daraa.10 This was followed nine months later by a government counter-attack, aided by Lebanese militia Hizbollah, which brought areas on the Lebanese border back under regime control. The ebb and flow of war displaced first tens, then hundreds of thousands. By June 2014 around half of the total population had been forced to flee their homes. The regime’s tactics of encircling and bombing dissident population centres using barrel bombs, cluster munitions and chlorine bombs have created suffering on a massive scale.11 The latest stage in the conflict has seen Russian forces take action in support of the Assad regime, aimed at preventing its collapse and ensuring a voice for Russia’s geo-strategic interests in any future negotiations. ISIS’s success in Syria, as in Iraq, is predicated on appalling levels of social destruction.14 However, there are also more specific factors at work. One of the key advantages that ISIS has enjoyed in Syria is that its military aims are different to those of the other major protagonists. Its commanders did not enter the Syrian conflict with the goal of either thwarting or accelerating the fall of Assad, rather their efforts were directed towards establishing and consolidating their caliphate. Their territorial strategy worked in symbiosis with that of the regime, in that ISIS wanted regions that Assad’s forces had decided were impractical to hold, particularly the north eastern regions around Raqqa. Unlike for the opposition armed forces, this was not a staging point on the road to Aleppo or Damascus, but became an end in itself.15 Another dynamic that aided ISIS’s consolidation was the deepening of sectarianism, and in particular the growing polarisation between a “Sunni” northeast and the concentration of Alawite and Christian populations in regime controlled territories. As in Iraq, ISIS is no bystander in this process, but has reportedly carried out many acts of sectarian “cleansing”. Finally, ISIS was much better placed than most other forces in Syria to benefit from the interaction between the conflicts in Syria and Iraq. As it had deliberately set itself the goal of breaking down the border between the two countries, ISIS could use each as a hinterland for offensive operations in the other, and could transport material, men and arms from one front to another. Can ISIS build a state? A year and a half after the fall of Mosul, there can be little doubt that ISIS’s leadership are not only serious about building a state, but they have been relatively successful in beginning to do so (notwithstanding limitations which we will discuss in more detail below). This does not mean that their project will succeed but it does mean that we need to understand firstly why building a new state is so important to them, and secondly what are the resources they can draw on as they attempt to do this. In the Iraqi case, US occupation played a transformative role by framing the struggle over the post-Ba’athist state in sectarian terms, deepening existing grievances and creating the material conditions for the birth of new ones. The post-Ba’athist state failed to keep its citizens safe from either the US occupying troops or other bodies of armed men, it failed to provide adequate services and basic infrastructure, and its security forces repeatedly carried out sectarian killings under the direction of party-militia leaders. Meanwhile, in Syria, Assad’s brutal attacks on areas liberated from government control have made the idea of returning to Ba’athist rule a horrific prospect for millions. It was both religiously correct and rational to redraw the borders of the provinces and to carefully study every development that takes place in the region. We are thus preserving the Sunni backbone, strengthening its resources and centres, and then regiments can be deployed in order to radically restructure the regions which will be subject to the rule of the Islamic State. The idea that a “Sunni backbone” is located approximately in the areas where ISIS is attempting to build its state makes some sense in an Iraqi context (provided one accepts particular sectarian narratives), but is illogical in Syria, where Sunnis were the majority everywhere with the exception of the coastal regions around Latakia and the southern province of Suweida. While it is always possible to read too much into a single document (the authenticity of which it is extremely difficult to prove), the ideas expressed in the Principles of Administration do chime with much that ISIS has done in practice. If it is genuine, it provides striking confirmation of the argument that ISIS’s success is based largely on alignment of interests between the small number of effective jihadi fighters who lead the organisation, former Ba’athist security and army officers and some of the political and military leaders in Western Iraq, in the context of the social destruction wreaked by war and counter-revolution. Despite this, there are still formidable obstacles in the way of ISIS consolidating as a state. Many of these obstacles are military. If the worldview encapsulated in The Principles is accurate, ISIS’s leaders are making an ideological virtue out of the fact that they are surrounded by enemies. They also display a rare talent for making them. Until now, ISIS’s commanders have been successful in managing battles on multiple fronts, and (despite claims by the Pentagon to the contrary) appear to have lost relatively little significant ground as a result of the US-led bombing campaign against them since June 2014.27 However, this situation may not last, and beyond having roused too many enemies at once, there are other potential military difficulties on the horizon. ISIS is well-stocked with advanced military hardware, thanks to having captured armaments, vehicles and tanks from the Iraqi and Syrian armies. But bullets are in relatively short supply, and spare parts for their vehicles will become increasingly scarce as the wear and tear takes its toll.28 Both of these things are critical to ISIS’s ability to take their enemies by surprise in unexpected military offensives. There are questions too, about how successfully ISIS can generate the revenue it needs to function as a state and prosecute its wars. Wildly fluctuating estimates of the group’s wealth have circulated in the media, and ISIS itself claimed to have set a budget of $2 billion with a $250 million surplus for 2015.29 The Financial Times estimated ISIS’s crude oil production to be running at around 34-40,000 barrels per day, earning the group an average of $1.5 million a day.30 Other sources have suggested lower levels of earnings from oil: Aymenn al-Tamimi published documents said to be “financial accounts” for December 2014-January 2015 from ISIS’s Euphrates province (spanning Deir Ezzor province in Syria and western districts of Anbar ­province in Iraq) in October 2015. According to the accounts, daily revenues from oil and gas in this province amounted to $66,400.31 The largest source of revenue listed in the document was not oil, however, but “confiscations” of property and goods, accounting for 44 percent of the province’s income. It would not be surprising if ISIS’s income is largely internal and essentially based on plunder. A key question for the future of the state-building project will be if ISIS can transform a warlord economy into a war economy, or if it will start to falter once the loot begins to dry up. The parochialism of the worldview expressed in The Principles seems at odds with ISIS’s grand claims to the universal loyalties of Muslims (even though its definition of who qualifies as a Muslim is very narrow), and contrasts with the group’s success in winning thousands of foreign recruits. In order to understand how these two, apparently contradictory aspects of ISIS’s success are linked, we need to analyse the relationship between three processes: the consolidation of transnational networks of jihadi fighters over several generations since the 1980s, the transformation of Muslims into all-purpose scapegoats by a new generation of right-wing populists and fascists (aided and abetted by more traditional conservatives), and the erection of a battery of racist and repressive laws restricting the rights of migrants and lately focused on “counter-terrorism”. In countries such as Britain and France, these processes can mesh with long histories of colonialism in the Middle East and active imperialist roles in the region today to potentially produce a self-reinforcing dynamic between the racists who target Muslims in the name of “counter-terrorism” or “defending Western values” and jihadi supporters or sympathisers who carry out attacks on behalf of ISIS. Nevertheless it is important to see Hollande’s war cry, not as the traumatised reaction to terrorist attacks, but a product of the interplay of deeply-rooted processes: the specific legacy of France’s colonial past, the racist logic of competition between fascists and politicians across the political spectrum who have constructed Muslims as all-purpose “others” and an increasingly interventionist foreign policy in the Middle East. A final crucial element is the failure of the French left to build effective opposition on any of these fronts, partly as a result of the dominance of traditions of anti-clericalism which lend a veneer of radicalism to the imperial and racist strategies of the state. Elements of this picture are present in many European countries, including Britain. We have our own populist right, which, while far behind the surge of votes for the Front National in France, has profoundly reshaped electoral politics in recent years. For decades, successive governments have compulsively tightened restrictions on migration and demonised refugees. The Tory government’s new Prevent counter-terrorism strategy makes it a legal duty for teachers, lecturers and other public sector workers to report on their pupils, patients, clients and co-workers if they suspect them of being “radicalised”.40 The British state has its own toxic history of ­colonialism and its own stake in the destruction of Iraq and Syria. The final element in the analysis is the question of how to prepare for the popular uprisings of the future, and what role the analysis of ISIS in particular and the analysis of Islamism more generally can play in this process. In the depths of a brutal counter-revolution which has wreaked havoc across the region, this may seem an academic exercise. Yet, there are plenty of reasons not to write off the potential for future explosions of popular protest. As we have discussed in detail in this article, the revolution and counter-revolution in Syria took place in a context which was already shaped by the catastrophe unfolding in Iraq. There are two reasons why it is important to reject lines of argument that either capitulate to the narrative of the military regime in presenting the Muslim Brotherhood activists as terrorists, or see the Brotherhood as a counter-revolutionary force distinct from, but comparable to the military.43 The first is that failing to see the contrasts between Islamist organisations such as the Brotherhood, which have a mass popular base and often play a reformist role, and ISIS, makes it more difficult to understand either. The second reason is that characterising the Brotherhood as counter-revolutionary makes it more difficult to organise effective resistance to the regime, as it cuts off the revolutionary forces that have survived the crackdown, from the large numbers of people who support or look to the Brotherhood as the main organisation still defying the military. The question of whether there can be at some point a revival of the popular movements which erupted across the region in 2011 is also important outside the Middle East. The best answer to those who want to justify bombing on “humanitarian” grounds, is to argue that far from needing Western warplanes and tanks to deal with dictators or warlords, ordinary people across the region have weapons of their own: mass strikes and protests. Although the revolutionary promise of 2011 was not ultimately fulfilled, it provides the most concrete demonstration of their power to remake the Middle East from below we have ever seen. 4:	See Naisse, 2015 and Atwan, 2015. 5:	Forced Migration Review, 2007. 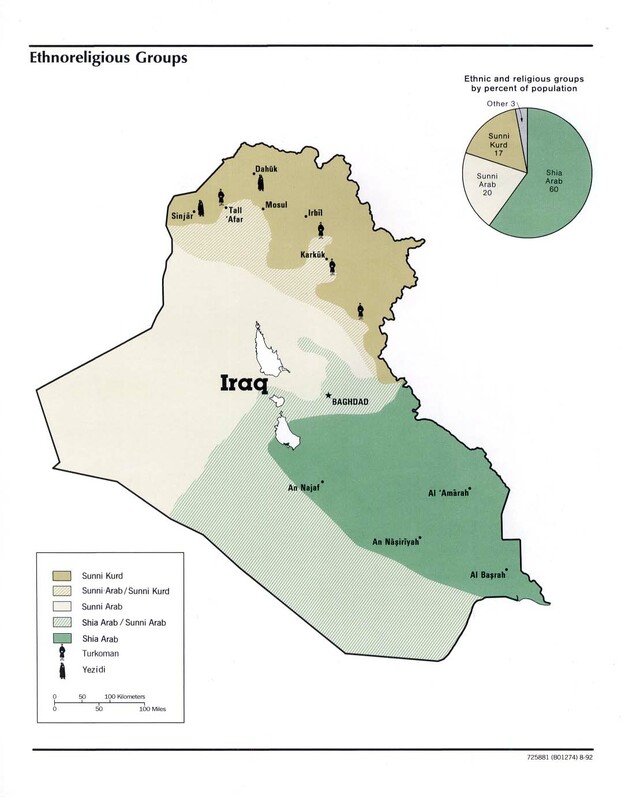 6:	Go to www.lib.utexas.edu/maps/middle_east_and_asia/iraq_ethnoreligious_1992.jpg (from the CIA’s 2003 Iraq country profile). 8:	Marsh, 2011; Amnesty International, 2011; Bakri, 2011. 10:	See Charron, 2014, for a summary of the key events in the conflict and the impact on the civilian population. 13:	Holliday, 2013, p56; see also International Crisis Group, 2014, p7 on the use of barrel bombs. 14:	See Naisse, 2015, on this point. 15:	Raqqa’s strategic importance to ISIS lay in the fact that this provincial town could be combined with territory in Iraq, thus creating a stable centre for ISIS’s state-building project across the existing border. 16:	See Shawcross, 1979, on the US bombing campaign against Cambodia which paved the way for the rise of the Khmer Rouge, and International Crisis Group, 2004 on the LRA. 17:	Al-Tamimi, 2015b; Malik, 2015. 18:	The quotation and the two that follow are the author’s own translation from the Arabic published by Al-Tamimi. 19:	Fromson and Simon, 2015, p40. 20:	“War makes states”, Charles Tilly once pointed out in an essay that compared the process of state formation to organised crime—Tilly, 1985. 22:	Solomon and Mhidi, 2015a. 23:	Atwan, 2015; Fromson and Simon, 2015. 24:	See Al-Tamimi, 2015a. The list of ISIS senior figures compiled by Charles Lister in 2014 includes the following ministerial roles alongside more conventional posts: War Minister, Minister of General Security, Minister of Foreign Fighters and Suicide Bombers, Minister for Weapons and Minister for Explosives—Lister, 2014. 25:	Al-Tamimi, 2015b; see Caris and Reynolds, 2014, on the ISIS court system in Syria. 27:	Gilsenan, 2015; Mak, 2015. 28:	Fromson and Simon, 2015; Solomon and Mhidi, 2015b. 30:	Solomon and Mhidi, 2015a. 32:	Morel, 2015; Schofield, 2015. 36:	Reuters, 2015; Chrisafis, 2015. 37:	Chrisafis, 2015; Moore, 2008; Alexander, Harriet, 2015. 40:	See Asquith, 2015 for a statement by National Union of Students leaders on opposing Prevent. 41:	See Alexander and Bassiouny, 2014, for more on this issue. 42:	See Attallah and Afify, 2015. 43:	For a survey of this debate, see Alexander, Anne, 2015b. Atwan, Abdel-Bari, 2015, Islamic State: The Digital Caliphate (Saqi). Davis, Eric, 2005, Memories of State: Politics, History and Collective Identity in Modern Iraq (Blackwell). Delphy, Christine, 2015, Separate and Dominate: Feminism and Racism after the War on Terror (Verso). Shawcross, William, 1979, Sideshow: Kissinger, Nixon and the Destruction of Cambodia (Simon and Schuster). Tilly, Charles, 1985, “War Making and State Making as Organized Crime”, in Peter Evans, Dietrich Rueschemeyer, and Theda Skocpol (eds), Bringing the State Back In (Cambridge University Press).